Everyone danced, accompanied by singing and rhythmic drums. 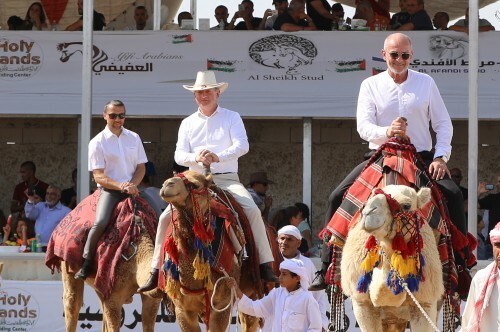 The obvious joy and emotions lent the scene a distinctive atmosphere to the 10th National Championship of Palestine at Holyland Riding Center in Jericho. These people know how to party! It was the most anticipated event of the show season in Palestine and there was a lot to celebrate: Palestine is a full member of ECAHO. 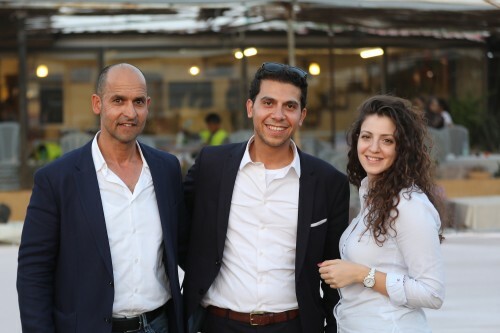 Jericho, located on the West Bank of the Jordan River, has an event venue with more than 150 boxes and various riding tracks: the Holyland Riding Center which opened its doors to welcome all Palestinian Arabian horse breeders and enthusiasts. It was in this exuberant atmosphere that the championship honours were awarded. The yearling fillies were the opener. The Gold Champion was given to Murjana Al Qamar (Hadaw x Shofa Jwelis), bred by Adel Jwelis and owned by Fadi D'Ebess. Her sire Hadaw represents the WH Justice sire line and traces back in tail female line to Serenity Bin Nadia, imported to the USA by Hansi Heck-Melnyk who passed away earlier this year. It was a close call as Silver winner Justinah RB (Aja Justified x RB Lady Mirage) scored one point less. Bronze was awarded to Thayma'a Al Rabe (Majd Al Rabe x Shatha Al Rabe). The competition for Junior Filly Championship was tough; 15 high quality fillies stood in a row but one shined out and so the refined grey Jolan AF accomplished UNANIMOUS Gold Champion Yearling Colt, proudly bred and owned by Afifi Arabians. Jolan's sire Jalal AF is a Gold Champion himself and sired by Al Ayal AA while the dam S.K. Al Shahila is by Al Khayyat out of Pasch Amore, representing mainly Russian bloodlines. Silver and Bronze were given to Ganador AH (Shiraz de Lafon x Golden Sunset) and Byraq Al Ameen (EKS Alihandro x Sundus Al Jamal) respectively. 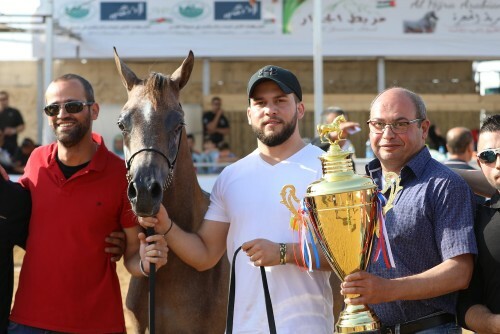 The Junior Filly Championship saw another unanimous decision: Gold winner Dora Al Ayal (out of Donia Al Jamal) was bred by Ariela Arabians and is owned by Ossama Da'na and Mohammad Abu Nijmeh. As her name suggests, Dora Al Ayal is by the excellent sire Al Ayal AA, currently on lease in the USA. The RFI Farid daughter M.M. Enya (x M.M. Eliana) accomplished Silver while Bronze was given to the Emerald J daughter Juella (x Jumanah). Tawfiq Hamad is the proud breeder and owner of Gold Champion Junior Colt Bahaa Al Quds, sired by multi World Champion EKS Alihandro and out of Marhabaa. Barigat Al Perugino (Perugino x Sabra Aenat) received Silver with Reda HL (Majd Al Rabe x Nadin Bint Nader) winning Bronze. 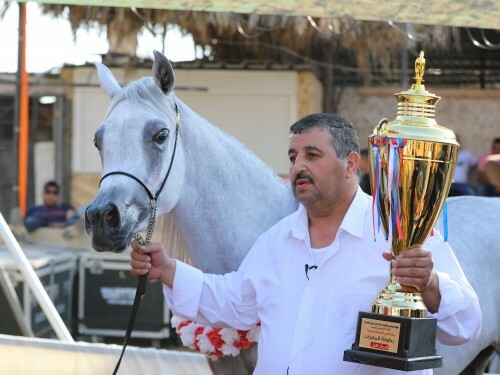 Ostura JFD is a classical glistening white mare of six years and the most worthy winner of Gold Champion Senior Mare, bred by Mohammad Hassan Youness and owned by Mohammad Bassoul, United Stud. Solaz J, combining the influential sires Magnum Psyche and Marwan Al Shaqab, is the sire of Ostura JDF whose dam Al Waad is out of Straight Egyptian bloodlines. Silver was given to Morena Justice (Mouheb x SK Amal Hayyati) and Amerat Al Rabe (Al Malik x Mistkeel Majic) received Bronze. QR Marc son Sun Down not only earned the highest score of all seniors, he also achieved Gold Champion Senior Stallion. Bred by Knocke Arabians, Sun Down is out of L Serenella (Zurki Al Rayyan x Salma), representing Straight Egyptian lines. Silver was given to Gilah, a son of El Amir Ibn Mawardi and out of Golden Sunset J. The WH Justice son Birjas Al Khair (x Rohara Martina) received Bronze. The upbeat atmosphere at those shows should not conceal the fact that breeding Arabian horses represent a challenge in this country. The number of breeders is small and life is far from simple. Nevertheless, thanks to their passion and dedication, Palestinian horses have successfully campaigned in Europe and the Gulf region. A very sincere thanks to the fantastic support of the Holyland Riding Center and the organizing team. Arabian Horse Global Network would like to extend our thanks for the excellent collaboration. Special thanks to all our sponsors who make it possible to cover this kind of Events. Another heartfelt thanks goes to photographer Jill Crols.